The Week in HD - Monday 3rd February | What Hi-Fi? This cult classic from Luc Besson reaches its 20th anniversary this year, and what better way to celebrate than owning it on Blu-ray. Natalie Portman makes a memorable debut as a 12-year-old girl who sees her family murdered by a corrupt and crazed cop (played brilliantly by Gary Oldman). 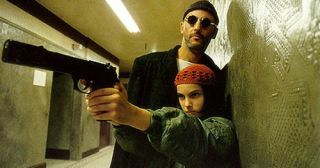 She swears vengeance, and is taken in by her unassuming neighbour (Jean Reno), who just happens to be an assassin. Stop us if you've heard this one before: a feel-good British rom-com by Richard Curtis starring Bill Nighy. And now add in time-travelling. Young Tim (Domhnall Gleeson) finds out that the men in his family have the ability to time-travel, and uses this power to better his life. And by that he obviously means getting a girlfriend (played by The Time Traveller's Wife's Rachel McAdams). But while Tim goes back and forth within his timeline to right some wrongs, it's his relationship with his elderly father (Bill Nighy) that becomes the main focus of the film. "In February 2013, a hole opened up beneath a home in Florida, and swallowed a man." That's an excellent premise for a good old horror film. Sinkholes have been opening up suddenly and inexplicably across the globe like an apocalypse playing pranks. This Horizon special explores why Florida's geology makes it the 'sinkhole capital of the world.' At least we know where to send Buffy when the next Hellmouth opens. When an air stewardess is found poisoned in her hotel room, DI Goodman and his team are thrown into the glamourous lifestyle of airline pilots and cabin crew. It looks like an impossible murder, but surely the Caribbean-based team will be able to solve the mystery? Brian Blessed graces the Kumars' living room with his larger-than-life presence, while Hustle and theatre star Adrian Lester, former Westlife member Shane Filan and Call the Midwife's Jenny Agutter also drop in for a chat. More Brockman family shenanigans and embarrassments, with Ben exploring human psychology, Karen getting competitive, and Jake giving parental advice. Sardines. The League of Gentlemen's Reece Shearsmith and Steve Pemberton bring us a six-episode anthology of dark comedy, with each episode telling a tale of humourous hijinks mixed with the macabre, all centred around doors marked 'number 9'. In the first episode, an engagement party in an old country house takes an unexpected twist as one of the bedrooms – the one with a lot of old baggage in it – is left unlocked. Starring Katherine Parkinson, Anna Chancellor, Julian Rhind-Tutt and Timothy West. Time Will Tell. When a murder suspect claims he is a time-traveller sent back from the future to stop terrible events unfolding that will change the course of human history, the 12th precinct crew are befuddled at every crazy turn the case takes them. Castle, of course, is over the moon. Winter Olympics, Angry Birds, Scarlett Johansson and the Super Bowl are the highlights of the week's news that Charlie Brooker rips apart and scrutinises for our enjoyment. The Golem. It's the festive season in Sleepy Hollow, and Ichabod embarks on a dangerous mission to communicate with his sort-of-dead wife, wanting to know why she never told him they had a son. He gets his answers, but ends up unleashing a monster from Purgatory in the process. Ah, Christmas. Live coverage of the 2014 Winter Olympics Opening Ceremony from Sochi. Clare Balding hosts this extravagant display of Russia's cultural history and achievements. A stunning, atmospheric psychological thriller from director Chan wook-Park of Oldboy fame. After India's father dies, her mysterious and charming Uncle Charle comes to live with her and her neurotic mother. But he's harbouring a dark secret, and instead of staying away, India becomes even more fascinated and infatuated. Starring Mia Wasikowska, Nicole Kidman and Matthew Goode. Day One. Grab a large cug of tea, settle yourself on the sofa, and stay in for a day's worth of sports, starting off with day one of the 2014 Sochi Winter Olympics. Snowboarding and cross-country skiing are the first events of the day. RBS Six Nations Rugby, live from Dublin. RBS Six Nations Rubgy, live from Murrayfield. Top Gear gets serious with their cars tonight. Clarkson takes the mighty McLaren P1 for a spin on the legendary F1 Spa Grand Prix circuit; Hammond tests the Alfa Romeo 4C on the shores of Lake Como (and Clarkson drives a quad bike in response); and James May heads to Camp Bastion in Afghanistan to check out the army's largest vehicle redeployment since the Second World War. And finally, Thor's Tom Hiddleston tries to set a fast lap time in the Reasonably Priced Car. Trainspotting and Slumdog Millionaire director Danny Boyle brings us this comedy-drama series about police PR, where an American is brought in to jazz up the image of Britain's police force. And then violence erupts. The Good Soldier. When a former Musketeer (guest star JJ Field as Marsac) reappears, the group are thrown into turmoil. Should they report the deserter, or will Aramis help his old friend solve the terrible massacre that wiped out Marsac's troupe?